From April, the UK government’s sugar tax will make 500ml bottles of high-sugar drinks cost an extra 14p, and two litre bottles an extra 58p. 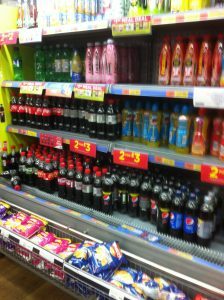 The higher price is intended to steer people towards choosing lower-sugar drinks. But promotions, such as “meal deals”, could make the sugar tax meaningless by negating the price difference…. This entry was posted in Uncategorized by Carol Williams. Bookmark the permalink.